Leaders of Volunteers: Will You “Be the Voice” for Our Profession? The phrase only contains three words, but “be the voice” is open to a number of interpretations – all of them of potential value to our field. 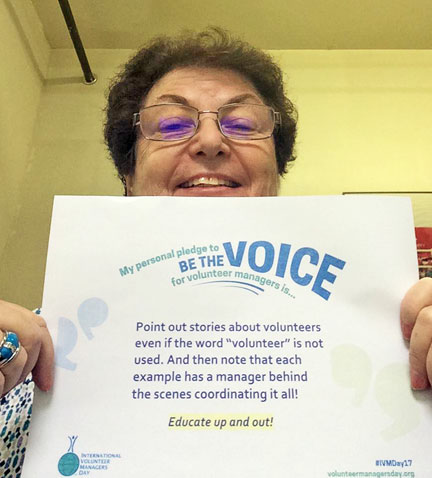 Whether actively or passively, every volunteer resources manager is a voice representing our profession, though not necessarily expressed in words. The vast majority of people, from the general public to our agency executives to the volunteers we lead, form an opinion about the work of volunteer engagement from our collective daily actions. Your leadership style, and especially the battles you choose to fight, reflect your philosophy of volunteerism. So what are you “saying” about volunteers and the skills of engaging them? Do you wait to be asked for something new and then comply, or do you initiate new ideas and work to get them accepted? Do you proactively recruit the widest range of people to volunteer or simply respond to whoever applies? Do you intentionally shine a spotlight on special contributions volunteers make? How about noting your role in helping volunteers to succeed? Every day you affect the perceptions of others about volunteering and volunteer management. Are you an assistant or an innovator? Quietly in the background or a risk-taker on the front line? One of the critical but often unacknowledged tasks of leading volunteers is that of public educator. Very few people are well informed about who volunteers are, the many things they do, or the best ways to work with them. Instead we continually encounter misinformation, false assumptions and stereotypes, whether from our bosses or even from volunteers themselves. Part of this is due to no one receiving actual training about volunteer management in their professional education. Further, because “anyone” can be a volunteer and almost everyone has done so personally, doesn’t everyone know all about it? No. But we, as skilled volunteer managers, do. From the attitude that “volunteers are free” and therefore you don’t need a budget, to forgetting to include volunteers on the e-mail list for important announcements, to thinking that it isn’t “nice” to criticize problem behavior by a volunteer – we are presented with many situations needing a response. Whenever we speak up, we are educating everyone and standing for the principles of effective and empowered volunteer engagement. IVMDay urges us to speak for ourselves as professionals – defined by our competence and not whether we ourselves are paid or volunteer. In other words, on November 5th it’s about us. Having said that, the truth is that we have no standing unless the volunteers we support are out there accomplishing something. So when we speak on behalf of our profession, we are also advocating for volunteers. They deserve the best leadership and the most resources possible so that they can keep doing their amazing work. It’s a full circle: if an organization wants volunteers to have an impact, it needs to lay the foundation for their success and for growing volunteer power. That includes assuring quality leadership, a recognized place at the decision-making table, and tangible resources. 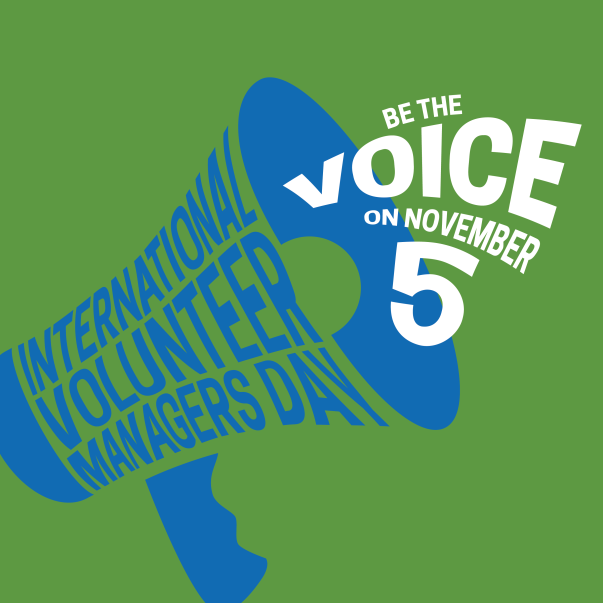 Valuing the work of volunteer management equates to valuing volunteers – and we will always speak out for that. Voices can be loud or quiet. What’s your style? Shouting in protest may have its place if something egregious occurs, but let’s hope you never face that sort of situation. Much more common is the need to confront a problem that results from a negative attitude or misinformation about volunteers. The kind of situation that makes you want to tear your hair out in frustration. What’s your approach? Do you stay angry in powerless silence? Or do you calmly and deliberately pursue a more acceptable outcome, whether by taking the problem higher to those with more authority, attempting compromise with the offender, or presenting strong data and a proposal to do things differently? Your tone of voice – and its effectiveness – is more in your control than you may think. Not speaking out is a response, too. Might the issue be raised legitimately in a staff meeting for open discussion? Should it be documented in one of your regular written reports? Can you pose a question (even anonymously) to an online discussion forum or blog to elicit a response that you can then use as part of your argument? Might your local association of volunteer resources managers want to write a “white paper” or some sort of information sheet for all executive directors, with pointers on how to handle whatever you are experiencing (which is likely to happen in their organizations at some point, too)? Note that I am talking about advocacy for volunteers as a method of winning respect for our profession. We cannot shout, “Respect us!” We can behave in ways worthy of respect, which includes speaking out and speaking up. We have the knowledge, the special skills, and the will. And, we speak for ourselves and on behalf of volunteers. There is legitimate power in our role, if we choose to exercise it on behalf of what we truly feel is best for our organizations and those we serve. I might also add the importance of speaking with. Whenever possible, invite and encourage volunteers to stand with you and speak for themselves. You should not be seen by your organization as a shield or barrier to keep volunteers busy by themselves. You are a two-way conduit, enabling communication and collaboration between volunteers and paid staff. As a strategy, appearing in a meeting with a well-informed volunteer who wants to be part of the discussion demonstrates your professional confidence as much as it educates your peers about volunteers. When should you use your voice? A lot of the time the need to speak up is unexpected, in response to something someone says or does. Be prepared! But also note that you do not have to whip out a long scroll with a detailed speech on the spot. Make it clear that you are concerned and will follow up. Then go back to the office, calm down, call a colleague, vent, eat chocolate. Then quietly determine the points you most want to make – and the outcome you would like to get. Once you have a strategy, you can work on making your voice heard, whether by setting up an appointment to talk it through or writing a report or memo to start the process. The great news is that you can also be the voice proactively. Think of all the opportunities you have to reveal and highlight the work of volunteers and, by extension, your important role. Check out many of my previous Hot Topics on things such as writing reports that “wow!” or transforming volunteer recognition events into celebrations of accomplishment rather than thanks for a tally of hours served. Ask to be on the agenda of staff meetings…and board meetings, too. Draw attention both to the ongoing, daily (often taken for granted) work of many volunteers and also the unexpected (and often unseen) activities volunteers step up to do. Finally, talk to your friends and family! The IVMDay Facebook group is urging colleagues to post a “pledge” for how each of us will “Be the Voice!” (Please add your pledge and photo by November 5th.) My pledge is: To point out stories about volunteers even if the word “volunteer” is not used. And then note that each example has a manager behind the scenes coordinating it all! Educate up and out! Most people don’t know what we do, so educate them! It might be fun…and smiling is a great way to feel empowered for International Volunteer Managers Day 2017! Enjoy your time in the sun. How do you define and use your “voice”? How can we collectively speak out for IVMDay? One of the concrete outcomes of the volunteerism blogger affinity group meeting held in July at the National Summit on Volunteer Engagement Leadership was a commitment to support IVMDay and to write about its theme to generate as wide a discussion as possible. So we've launched a "blog carnival"! Liza Dyer of VM Snark is chairing the carnival and has provided a submission form for your use. Remember: writing is like a tree falling in the forest; only if we get a response from readers can we know if we’ve been heard. So please use the comments section – available on every blog – to express your opinion, whatever it may be! If you post a public reflection about what being the voice means to you, please complete the blog carnival form or send us the link by e-mail to info@energizeinc.com. Thanks Susan for so succinctly and eloquently outlining what it means to 'be a voice' for our sector. This year's theme has been designed to ensure that those working in the field can take some sort of affirmative action, so let me add my encouragement to all reading this hot topic to make a pledge to do something. Lots of little actions can sometimes achieve important collective change. Hear, hear, Andy! Excellent point. I love the IVMD theme! and the poster looks great. Susan, your Hot Topic, "What is a Voice?" is great reading. I especially appreciated the bullet points in the section "Expressed How?" and the recognition that voices can be loud or quiet...and effective both ways, depending on the situation. Thank you for your ongoing commentary! Thanks, Clare. Every one of us can find and use our voice. Susan, thank you for being a tireless champion of those who work in our various fields of Volunteer Leadership. We accomplish our work - some with quiet voices - and others louder - but often behind the scene as we encourage those who have a passion for our various organizations. We seek to understand what a volunteer loves, point them in the right direction, and never forget to genuinely appreciate and value the talent, time, and heart they bring each day to the work they do. Our work is much like a conductor who seeks the right musicians, with the talent, and instrument, to play in an orchestra of collectively beautiful accomplishments together.